New Harbinger Publications, 9781626251205, 240pp. Alex Korb, PhD, is a neuroscientist who has studied the brain for over fifteen years, starting with an undergraduate degree in neuroscience from Brown University. He received his PhD in neuroscience from the University of California, Los Angeles, where he wrote his dissertation and numerous scientific articles on depression. He is currently a postdoctoral neuroscience researcher at UCLA in the department of psychiatry. Outside of the lab, he is a scientific consultant for the biotech and pharmaceutical industry, and is head coach of the UCLA Women's Ultimate Frisbee team. He has a wealth of experience in yoga and mindfulness, physical fitness, and even stand-up comedy. 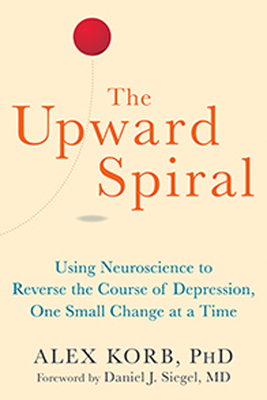 Foreword writer Daniel J. Siegel, MD, is executive director of the Mindsight Institute and associate clinical professor of psychiatry at the University of California, Los Angeles School of Medicine. He is author of The Developing Mind, The Mindful Brain, and other books, and founding editor of the Norton Series on Interpersonal Neurobiology.